I realize these shows are not as well known but dammit someone has to review them so it may as well be me. I don’t have a lot of the profiles for the above wrestlers on Joshi City but the ones I do are active links if you want to know a bit more about the Joshi wrestlers. Kagetsu is playing a bit of a double life at the moment, as here she is her normal nice self while in Stardom she is an evil member of Oedo Tai. She teams with Iida from WAVE, who is 24 but is a five year veteran. They are against Hinata, a young Freelancer, and Rina Yamashita who is in her second year of wrestling for Osaka Pro. Kagetsu and Iida definitely have the experience advantage but Yamashita has been pushed hard recently and is always up for sneaking in an upset. Yamashita and Iida start for their teams and trade some quick holds, big shoulderblock by Yamashita and Hinata jumps on her back to help Yamashita hit a double kneedrop. Yamashita tags in Hinata, elbows by Hinata to Iida but Iida returns the favor. Iida bounces Hinata around the ring and throws her down by the hair, cover by Iida but it gets two. Iida tags Kagetsu and Kagetsu kicks Hinata in the back, Yamashita runs in to help but Iida tosses her out of the ring. Kagetsu puts Hinata in the ropes and chops her before hitting a dropkick, running elbow by Kagetsu but Hinata fights back with elbows. Kagetsu knocks Hinata back to the mat but Hinata hops up and hits a spinning headscissors. This gives her time to tag Yamashita, Iida comes in too but Yamashita shoulderblocks both of them down. Kagetsu and Yamashita trade elbows, Kagetsu springboards up to the top trope and knocks over Yamashita with a missile dropkick. Running elbow by Kagetsu in the corner but Yamashita hits a hard knee followed by a kick to the head for a two count cover. Kagetsu catches Yamashita with a dropkick and tags in Iida, Iida throws Yamashita in the corner and hits a running uppercut. More uppercuts by Iida but Yamashita hits a lariat followed by a backdrop suplex. Yamashita tags in Hinata, Hinata gets on the top turnbuckle and goes for a diving crossbody on Iida, but Iida moves and Yamashita catches her. Yamashita throws Hinata at Kagetsu, Hinata grabs Iida but she eats an uppercut. Hinata kicks Iida and delivers a tornado DDT, she goes up top and hits the diving crossbody for a two count. Hinata goes for a bodyscissors roll-up by Iida blocks it and applies an abdominal stretch. Dropkick by Iida and she puts Hinata in a cross armbreaker, but Hinata makes it to the ropes. Iida dropkicks Hinata and hits a fisherman suplex hold, but Yamashita breaks up the cover. Hinata sneaks in a few quick pins with no luck, Iida finally blocks one and puts Hinata in the Mudo, Hinata struggles but has no choice but to submit! Iida and Kagetsu are the winners. A perfectly acceptable opener, even if it didn’t do anything overly memorable. Everything was pretty smooth here, which I wasn’t sure would happen with Hinata in there (Hinata is young and adorable, but still honing her skills). I was hoping with Kagetsu and Iida in there they would do something a bit more special but it stayed pretty mellow throughout. Not a bad way to start but pretty forgettable. I am listing this together as it is two singles matches taking place at the same time, with two referees in the ring. All four of them are low level indy wrestlers, with the only possible exception really being Fujigasaki but she is only 19 years old. Mii is also known as Apple Miyuki and is officially affiliated with Ryukyu Dragon Pro Wrestling, while Okubo is a Freelancer that mostly wrestles in small promotions like Dotonbori Pro and Super Fireworks. On the other side, TORU is a Freelancer that also frequents Dotonbori Pro while Fujigasaki is a young wrestler from Pro Wrestling WAVE. This is random, but wrestler produced shows tend to have some random situations. Why both matches are taking place at the same time I have no idea. All four wrestlers begin the match in the ring and tie-up, but they all end up knocking each other over. Even though it appears to be two singles matches, they are also interacting with each other randomly as well, just to make it more confusing. Mii gets Fujigasaki in a submission while TORU does the same to Okubo, and they both cover their opponents for two. TORU dropkicks Okubo out of the ring, he goes to do a dive but at that moment Mii suplexes Fujigasaki in his path and he trips. Mii kicks TORU for getting in her way before hitting a sliding kick on Fujigasaki, Mii wants to do a dive but Okubo puts TORU in a submission hold in her way. He slowly inches out of her way, Fujigasaki and Okubo attack their opponents in opposite corners and Fujigasaki attacks both TORU and Fujigasaki, but then Fujigasaki and Okubo start to fight. This allows Mii and TORU time to recover, and they roll up their opponents as both get a three count! Mii and TORU are your respective winners. I don’t have a lot to say about this weird little match. There were some cute spots with both ‘matches’ interacting with each other, but besides that it was just a few minutes of strike battles before a quick ending. Very unique but still safe to skip. This event is only getting more weird instead of less. Gabaiji-chan is PSYCHO but he acts like an old man whenever he has his cane. Without his cane though he suddenly turns ‘young’ and is able to run around until he is handed his cane again. Toyota of course is one of the most legendary Joshi wrestlers ever and still is fairly active on the scene. Obviously this will be a comedy match but Gabaiji-chan can be amusing in small doses so we will see how it goes. As you probably guess, this match is pretty much all shtick and takes several minutes to get going. 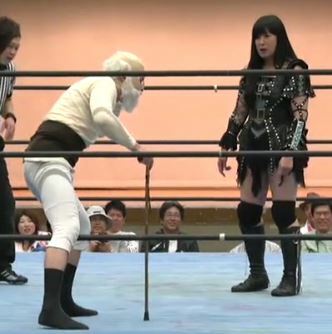 Gabaiji-chan gets the advantage over Toyota and hits her with his cane, but it doesn’t as long as he is old and tripped. Toyota puts Gabaiji-chan in the Muta Lock but Gabaiji-chan gets his cane on the ropes to break the hold. Gabaiji-chan slowly gets to the top rope, he grabs Toyota’s arm and slowly walks the ropes but Toyota knocks his cane away and he crotches himself on the top rope. Gabaiji-chan drops his cane however and suddenly wrestles with the ability of a young man, as he hits a dropkick followed by a swandive crossbody for a two count. Gabaiji-chan goes for a chokeslam but Toyota elbows out of it, Toyota kicks Gabaiji-chan into the corner and he grabs his cane which kills his youth again. Toyota gets Gabaiji-chan on her shoulders but Gabaiji-chan catches his cane on the top rope to block the hold. Toyota goes up top but Gabaiji-chan holds his cane up so that Toyota can’t hit the moonsault. Gabaiji-chan tries to hit Toyota with his cane but Toyota blocks it and kicks Gabaiji-chan. Gabaiji-chan’s cane is knocked away from him, allowing him to hit Toyota with a chokeslam. Gabaiji-chan goes up to the top turnbuckle but Toyota rolls out of the way of the somersault senton. Gabaiji-chan slides away from Toyota but he hurts his back when he tries to pick her up. Toyota gets Gabaiji-chan on her shoulders and hits the Japanese Ocean Cyclone Suplex for the three count! Toyota is the winner. Like the last match, this was just about what you’d expect it to be, but Toyota played along and it did have some funny spots. Gabaiji-chan is a good character and is an entertaining act, but purely as a midcard type of act of course as there isn’t much more you can do it with. Toyota was fun as well, overall not a bad watch but clearly just a comedy match. Another unique pairing, even though both are very accomplished wrestlers they have only met a handful of times. Their most recent singles match was in January, when they went to a 15 minutes draw, so they have unfinished business. Syuri is formally the Ace of REINA but became a Freelancer after she signed an MMA contract with Pancrase. Kizuki is one of the young stars of Ice Ribbon and has held both the singles and tag team championship in the promotion. After Syuri gets Kizuki to the mat with a headlock, Syuri puts Kizuki in a wristlock but Kizuki reverses it. Kizuki boots down Syuri in the corner and hits a series of chops before putting Syuri in a camel clutch. She then puts Syuri in a stretch hold but Syuri comes back with a Backstabber and stomps on Kizuki on the mat. Kicks by Syuri to the chest and back, but Kizuki hits a crossbody for two. Mongolian Chops by Kizuki and she hits a series of running sentons, but Syuri avoids one and kicks Kizuki into the corner. Jumping knee by Syuri and she hits a double arm suplex for a two count. Cross armbreaker by Syuri but Kizuki gets a foot on the rope, back up Kizuki regains control and puts Syuri in a backbreaker. Kizuki goes to the second turnbuckle and hits a diving senton, but Syuri kicks out of the cover. Knees by Syuri but Kizuki hits a jumping lariat, suplex by Kizuki and she gets a two count. Kizuki goes up top and delivers the swivel body press, but Syuri gets a shoulder up. Syuri snaps off a German suplex but Kizuki gets up and hits a German suplex of her own. Jumping lariat by Kizuki but Syuri returns with a jumping knee, Syuri takes down Kizuki and puts her in a seated armbar. Back on their feet they trade elbows, kick by Syuri and she drops Kizuki with a knee lift. Kizuki hits a quick German suplex hold for two, Kizuki sneaks in a series of quick pinfalls but Syuri kicks out each time. Kizuki goes off the ropes but Syuri catches her with a high kick. After trading pin attempts, Kizuki goes for a crossbody but Syuri rolls through it. Jumping knee by Syuri and she hits a German suplex hold, but Kizuki kicks out. Kicks by Syuri but Kizuki catches one and hits a dragon screw, inside cradle by Syuri but it gets a two count. Jumping lariat by Kizuki but Syuri hits a high kick as the bell rings, signifying time has expired. The match is a Draw. And we have reached the main event, which is just as odd as everything else on the show. Shida of course is the producer of this show and is one of the leading Freelancers in Joshi. Kasai is from FREEDOMS and is best known for his work in Big Japan, while Owashi is a Freelancer that recently has been in DDT. Shimono hails from Osaka Joshi Pro, Kishiwada is an older Freelancer previously known as BIG BOSS MA-G-MA, and finally Tadasuke is a Freelancer that mostly wrestles in smaller promotions like Dotonbori Pro. Definitely an odd collection of wrestlers, hopefully they put on a good match for the main event. Shida begins the match against KISHIWADA AKA BIG BOSS MA-G-MA and I am already excited. They trade chops, which Kishiwada gets the better of, Shida goes for a hip attack but Kishiwada doesn’t budge. Kishiwada throws Shida to her corner so she can tag in someone else, and Kasai comes in as the legal wrestler. Tadasuke tags in too, he runs the ropes with Kasai but neither gets an advantage so they tag in Shimono and Owashi. Owashi taunts Shimono so Shimono stomps on his foot, drop toehold by Shimono and she shoulderblocks Owashi to the mat. She can’t slam him though, as Owashi lands on top of her, which gives him a chance to tag in Kasai. Kasai drops Shimono with a piledriver and tags in Shida, backbreakers by Shida to Shimono and she puts her in a crab hold but Shimono crawls to the ropes to break it up. Shida puts Shimono on her shoulders and spins her down into a backbreaker, but the cover is broken up. Shida’s teammates come into the ring to help, as do Gabaiji-chan and Toyota, but Gabaiji-chan takes so long to do an attack that Shimono recovers and tosses all of them one by one. The action spills out of the ring (with Gabaiji-chan still alone in it), but they eventually return with Shida being stomped by Kishiwada and Tadasuke. Kishiwada hits a body avalanche in the corner before hitting a suplex, he tags in Shimono who continues the beatdown. Team Kishiwada take turns tagging in as Shida is the Face in Peril on her own show, Kasai comes in to help but Shimono takes care of him. Kishiwada goes for a suplex by Shida blocks it and hits a vertical suplex of her own. Hip attack by Shida and she tags in Owashi, Tadasuke tags in too but Owashi drops him with a dragon screw. Tadasuke comes back with a vertical suplex, Kishiwada and Kasai are tagged in and they trade lariats with neither wrestler going down. Kasai finally wins that battle but Kishiwada gets back up and lariats Kasai to the mat. They tag in Shimono and Shida, enzuigiri by Shida but Shimono knocks her to the mat and hits a seated senton for two. Kishiwada and Tadasuke come in the ring and Tadasuke rocks Shida with a hart lariat. Brainbuster by Kishiwada to Shida, but Shida gets a shoulder up on the cover. Fire Thunder Driver by Kishiwada, but this time the cover is broken up. Kishiwada hits a moonsault off the second turnbuckle, he picks up Shida but she reverses the powerbomb attempt with a hurricanrana. Shida is triple teamed in the corner but her teammates come in and help clear the ring. Hip attack by Shida to Shimono, Kasai goes up top and hits the Pearl Harbor Splash, but the group pin is broken up. Shida sits up Shimono and hits a running knee, but Shimono reverses the cover into her own two count. Shida slams Shimono to the mat but Shimono sneaks in an inside cradle for two. Jumping knee by Shida and she drops Shimono with a Falcon Arrow. Three Count by Shida, and she gets the victory! Most of the time on produced shows, you get wrestlers that seem to be putting in extra effort in support of one of their own. I didn’t see that as much here, it was a pretty small produced event and a lot of the matches just felt like the most basic version that they could come up with. Syuri/Kizuki was disappointing as was the opener, both were perfectly fine matches but didn’t go beyond that. The comedy match was entertaining but nothing too special, the only match that had some memorable spots and quality exchanges was the main event. Overall a bit of a letdown and a pretty skippable event, but Shida fans will want to catch the main event.